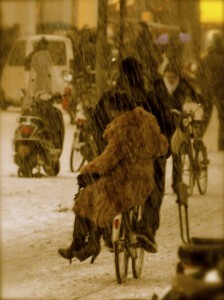 Are you looking to beat the winter blues & still ride with style? Thick and/or waterproof gloves will make sure you can still use your digits to control your brakes & gears, two pairs of socks or cycling overshoes will keep the feeling in your toes. Wearing a hood might seem like the best way to enclose your head & neck but as soon as you need to look behind, you’re likely to find that rather than looking the driver behind you in the eye, you’ve got a face-full of the back of your hood. Hats (or helmets with winter liners) turn with your head and so don’t limit your awareness of your surroundings. 3 – Layer it up! 4 – …but be ready to strip off! As you warm up you might need to shed some layers. Leave space in your luggage to fit your jumper or coat in after you’ve been going for a mile or so. Frequent maintenance is vital to a reliable machine but some additional tweaks for winter can make all the difference. Grease inside your cable-housing will prevent water from creeping in and freezing your brakes on a cold morning. Fitting mudguards and flaps at the ends which reduce road spray to help keep the water on the road and not in your shoes. Make sure everything that needs it is lubricated to reduce the effect that the salt from the road will have on corrosion (hubs, chain, pivots, etc). Your local bike workshop can help with all these and more. Anything to make you more visible is going to help. Sometimes just some high contrasting colours are enough. Reflective tape stuck onto bits of your bike can make a big difference. Super bright lights make you shine out like nothing else! Bear in mind that some solutions are better than others (e.g. 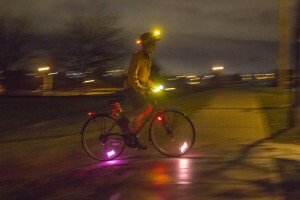 lights powered by a dynamo in your wheel hub are a far more reliable battery-free solution than some barely single-use hi-vis products on the market). Asserting your position on the road will further add to your visibility. It’s highly unlikely that somebody’s out there to run you down so riding in the middle of the lane is a safer place to be; other road users will have to overtake you with proper space rather than squeeze past you as if you’re not there. Book a cycling lesson if you feel nervous about taking the lane. If you can afford it, puncture proof tyres (at about £40 per tyre) will greatly reduce the risk of that down-heartening puncture in the dark cold rain after a hard day’s work. If that’s a bit pricey, keeping your tyres well-inflated will make sure they stay as strong for as long as possible. It’s worth knowing that tyres inflated to a lower pressure will provide better grip but your speed will be lower too. Having a warm change of clothes to get into at the other end of your ride can really help a smile to surface. A problem shared is a problem halved. 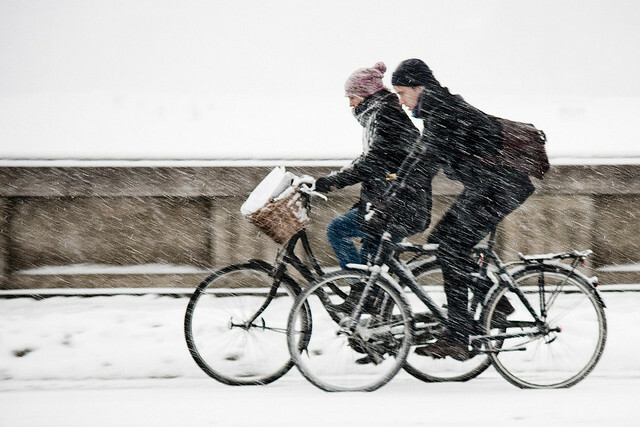 Find other people who ride in the winter and you’ll probably find the strong camaraderie between fellow cyclists. Common questions include: What wintery additions do you make to your bike/s? Which brand of winter coat is both waterproof AND breathable? How many days have you worn your merino base layer without washing it? What’s in your hipflask that sits at the bottom of your pannier? As soon as you’ve got everything right, you’ll find other people will start admiring you and maybe even taking on a winter commute themselves.